I can’t make this stuff up, and apparently, neither can House Beautiful. The Wall Street Journal featured an article about pajama lounges earlier this year, last year’s Southern Living House of the Year included one , and a quick search of Pinterest turns up board after board called – you guessed it - “pajama lounge”. Honestly, if ever there was a time to re-watch “Josie and the Pussycats”, it’s now. The trends, people. How’s a girl to keep up? I have so many questions about the pajama lounge that I don’t even know where to start. Let’s go with the obvious first: who has that much space? And why do you need a media room if you are also going to have a TV in your pajama lounge? Isn't the point of a "family room" to provide a space for the family to hang out? If you for some reason can't just use your family room (I guess because strangers come by on a regular basis and catch you in your pajamas? ), why not just put a TV in the play room and call it a day? I mean, I love my kids and all, but I fully support the upstairs play room that is NOT intended for adults. There’s only so much Jessie I can take. By the way, doesn’t the word “lounge” imply that there are cocktails? Does a pajama lounge have a spot for coffee and fruit loops or a blender for umbrella drinks? This idea of parent-kid bonding and lounging in pajamas is fantastic, yes, but can we be just a little realistic? First, if there is a TV, your bonding is minimal. Second, why can’t we bond over something active? Cooking together or folding laundry comes to mind. I know my kids feel closer to me after we’ve all folded our clothes together. Wait, that’s not right. Sorry. We could bond over a hike or a bike ride. I’m just not seeing the need for a specific room for bonding. The only time I’m lounging with my kids in pajamas is at 6 am on Christmas morning because Santa paid a visit. I don’t need a room for that. I am, however, all for the playroom or the family room and I am also all for a kid-dedicated TV that can be used for emergency situations (e.g., sleepovers, movie night with friends, and the aforementioned Jessie overload). I would even suggest that we can just rename the playroom the pajama lounge and call it a day. Here, here, here, and here are a few examples of rooms in which I would gladly hang out with my kids in our pajamas. Boom boom pow inspiration image by Allison Black Illustration. 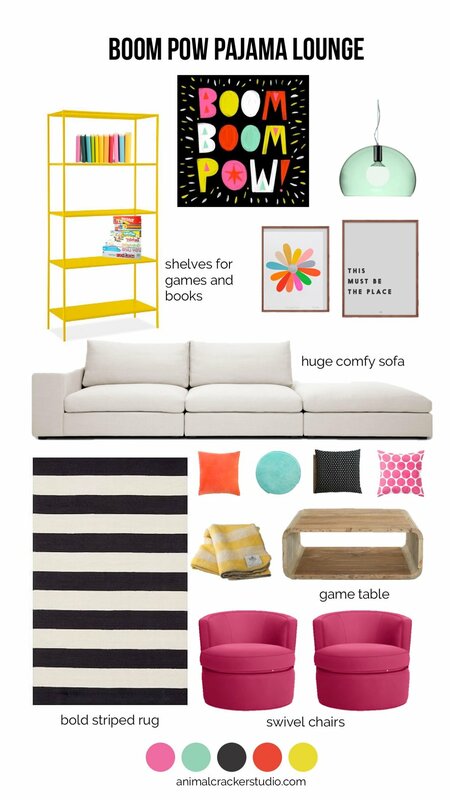 Product sources: Shelf, light, flower print, place print, sofa, rug, coffee table, red pillow (not available), black pillow, pink pillow (no longer available but still available in mint or yellow), mint pillow, yellow blanket, swivel chairs (shown in Sunbrella canvas pink). You can also check out items for this post on my Pinterest board. I think I'll stay awhile and hang with my kids. How about you?